The Netherlands is well known around the globe for our battle with the sea and the rivers flowing through our tiny country. 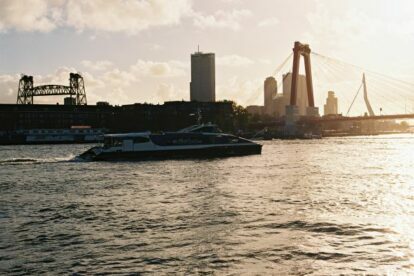 The harbor of Rotterdam has been able to become one of the most important harbors in the world thanks to the sea and the rivers reaching all the way to Germany. For some years now the rivers haven’t just been used to transport goods: thanks to the Waterbus, people can travel along the rivers as well. Located right next to the Erasmusbridge you can find the docking station of the Waterbus. From this station you can travel all the way to Dordrecht but you can also travel to the windmills of Kinderdijk. A direct line is operating from May till the end of September; from October till April you can get there with a transfer at Ridderkerk (bring cash). Usually I take the Waterbus to Kinderdijk to get some coffee at my parents’ house but of course you should head over to visit the UNESCO world heritage Windmills at Kinderdijk, two lines of beautiful windmills created many years ago to protect the countryside from flooding. Not into windmills? Take the Waterbus to Dordrecht, one of the oldest cities in the Netherlands. Make sure you check the website to get an up-to-date operating schedule.